Voila! 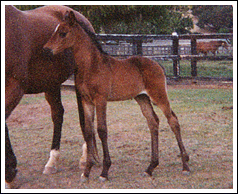 FR is an elegant 2002 dark bay filly by VDL Orame out of Nymphe G, by Jus de Pomme. Voila! FR has an exceptional pedigree for breeding or performance.